Click here for more photos of the event's CHAMPS & GRAND CHAMPS on Facebook! For our forty-ninth event it was our pleasure to finish off our anniversary month by celebrating our first year of Trivia Club at The Rec Room with The Rec Room Royale 2017/2018! Which teams would return to bring home the first playable Grand Championship? Who would take a hold of the annual prize? Ultimately it would come down to the wire, while also giving Trivia Club another first in The Hall! Trivia Classic came to an end with an excellent mix of new and returning faces! 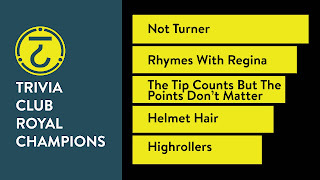 The Tips Count But The Points Don't Matter returned for the first time since their Golden VHS winning debut at the beginning of August and held the lead over the field! Seven points behind them were Highrollers, looking to add to their seventy points from the week before! Four points behind those Highrollers were Not Turner, another team very much in the running from last week who also held a ten point lead on the team that Really Makes U Think! Not Turner were tied with even more Really Makes U Think alumni who were sharing a big table with Highrollers, Helmet Hair! Rounding out the first round Top Five (top five, top five) of The Rec Room Royale Finale were newcomers Alexa: "Sorry I Didn't Get That"! Rounding out the field were Longlorn Ladies, a team visiting from Calgary, and Team Hopefully Not Last... who were at the moment three points away from turning it around! Tri-Pardo was our second round at The Rec Room, which saw Highrollers roll the first question for twelve points! Helmet Hair continued the roll from the table of good friends, adding an additional nineteen points for the second question, and finally Alexa rolled fifteen points for the third question! This meant that forty-six points were up for grabs in total! Team Hopefully Not Last would get all the way to second place after hitting a triple in round two, while all other teams would add thirty-one points from the first and second questions, save for Helmet Hair who would add twenty-seven points from the first and third questions, while the Longhorn Ladies were left pointless! 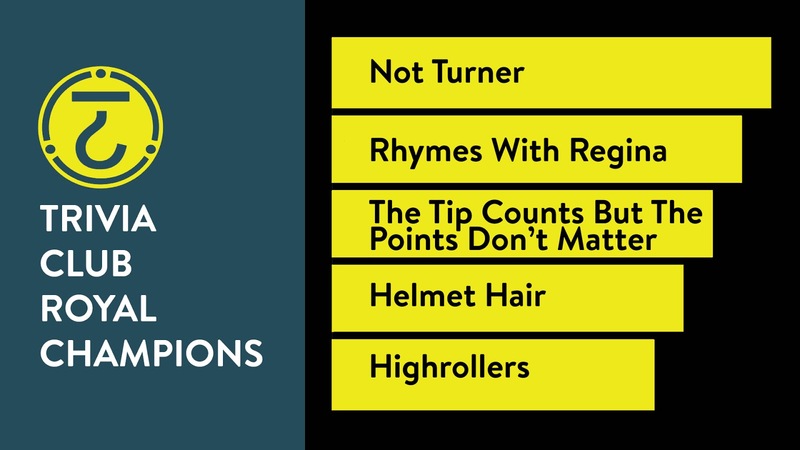 This meant that going into the Trivia Finale , both Not Turner and Highrollers had accrued enough points to pass Rhymes with Regina from the week before in the total aggregate for The Rec Room Royale... though if both teams were to go all-in, Not Turner would still have the edge! Thing was... neither team went all-in! This was potentially because both teams sensed they would not be able to beat The Tip Counts But The Points Don't Matter for the Golden VHS on this night... but could smartly wager their way to becoming Trivia Royalty at The Rec Room in our inaugural Royale! With everyone wagering, all teams went all-in including the leaders on the night The Tip Counts But The Points Don't Matter... all teams save for the leaders in The Race for The Rec Room Royle! Highrollers wagered thirty-five of their points, while Not Turner wagered twenty-nine and a half! Little did they know that if both teams answered correctly... Not Turner now held the slightest possible margin of victory and could win our first annual event by HALF A POINT against Highrollers, unheard of over two weeks of competition! 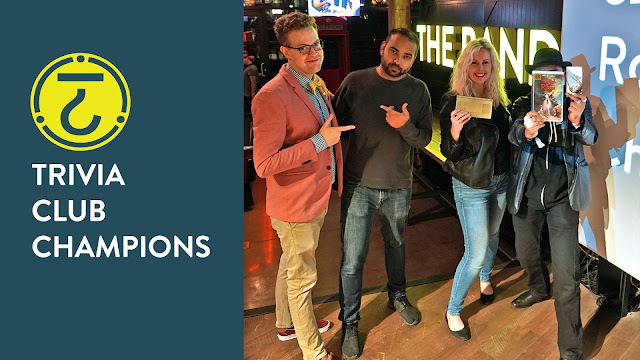 That was not to be, as less then half of the teams competing would correctly answer the Trivia Finale chosen by The Tip Counts... and Highrollers would not be one of them! This meant that the margin of victory for The Rec Room Royale would be wider, though not by much! With 141 points on the night, finishing third in the overall Royale standings and becoming TWO-TIME GOLDEN VHS CHAMPS... THE TIP COUNTS BUT THE POINTS DON'T MATTER! They become one of a handful of multi-time Champs at The Rec Room! 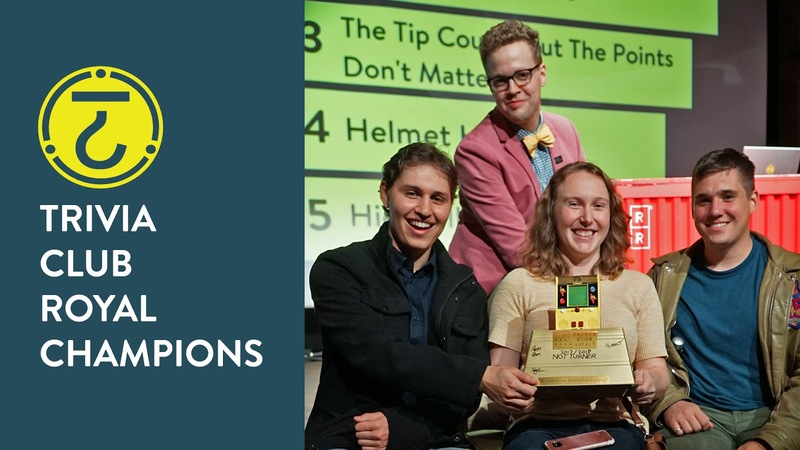 Runners-up on the night and fourth overall in The Rec Room Royale standings were Helmet Hair, ultimately finishing ahead of Highrollers in the overall standings after a tough Finale! In the rare night that the Golden VHS wasn't the top prize however, for the first time a team that did not win a Golden VHS during an annual multi-week event... and in fact a team that has not yet won a Golden VHS won a Grand Championship! With 169 points over two weeks, and the inaugural TRIVIA ROYALTY AT THE REC ROOM... NOT TURNER! Turner would be proud? Yeah he would! It's fitting that The Rec Room would have new faces take home the Royale Championship, our first playable annual trophy, as their have been thirty-eight different VHS winners over forty-nine events! More then twice the number of Champions in the first fifty events at Cardinal Rule (which had 16 winners), and still more then 10 different winners then Lou Dawgs (which had 22 different winners), or Hitch (which saw 24 separate) in their first fifty events! 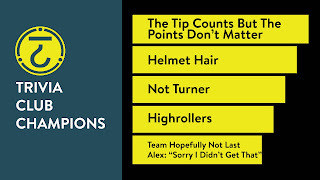 Congratulations to The Tip Counts But The Points Don't Matter, and of course congrats as well to Not Turner! Anything is possible at The Rec Room! Thank you to everyone, to those who competed this week and last week, and to all those who have come out to have fun at Trivia Club at The Rec Room over the past year to #TellBetterStories! We look forward to having you out for our second year of Trivia Club at The Rec Room, and no less then our FIFTIETH EDITION of Trivia Club at The Rec Room on OCTOBER 2nd, 2018!